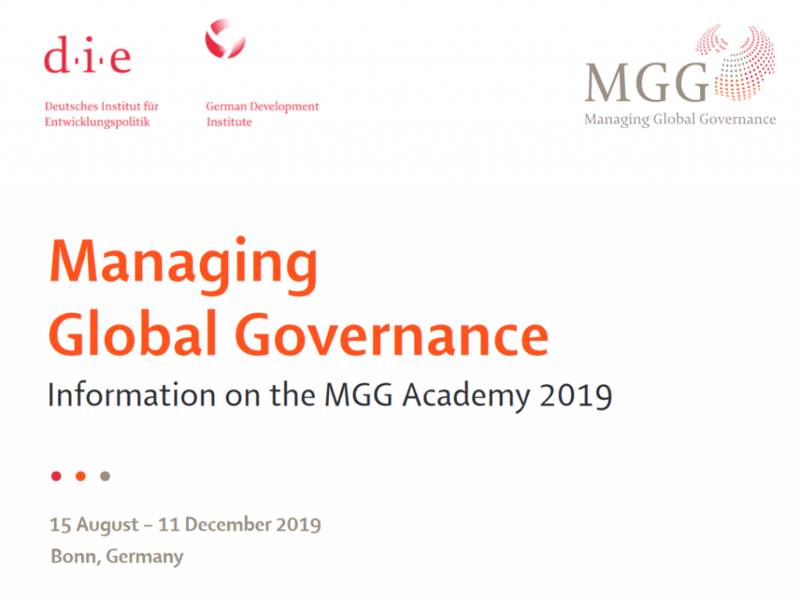 The Managing Global Governance (MGG) Academy is a dialogue and advanced training course that brings together young professionals from rising powers and from Europe. Its overarching purpose is to support the development of future change makers who are addressing global challenges and are dedicated to transformative change. The Academy is based on the premise that future change makers need profound knowledge of content and the ability to analyse complex interdependencies as well as personal and social skills. The course thus blends knowledge components on global governance challenges with the development of the participants’ leadership competencies. In an action-oriented component, participants apply the knowledge and competencies they have acquired and develop a collective change project. After completing the MGG Academy, the alumni are invited to become actively engaged in the MGG network. They may get involved in ongoing research and policy projects to promote the implementation of the 2030 Agenda or develop their own projects to promote transformative change. 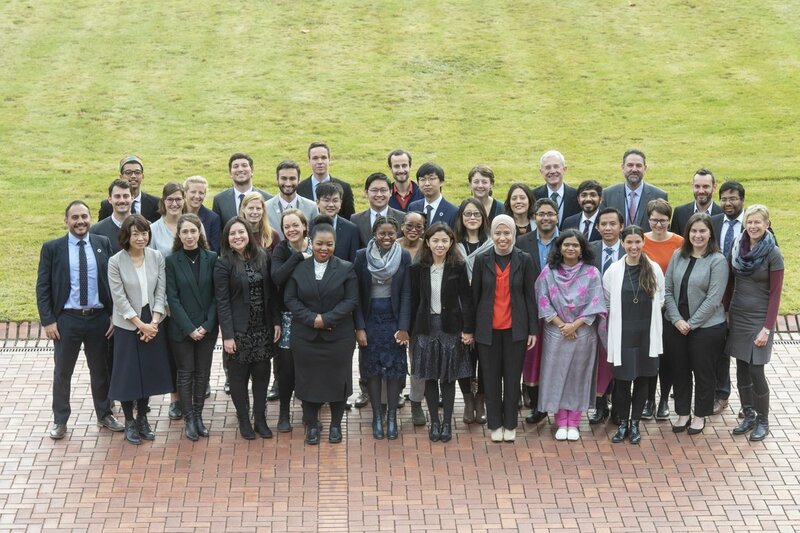 Participants build up an international network, develop their leadership competencies and strengthen their abilities to address global governance issues in their institutions’ work. Opportunities for new forms of cooperation on innovative ideas, research topics and projects. Partnership in a vibrant global network of institutions from rising powers and Germany/Europe contributing to the implementation of the 2030 Agenda. Therefore, institutions should select a young professional who matches the participant profile described above and who can benefit from the MGG experience in fulfilling her/his current or future assignments. The participants in the MGG Academy are granted a scholarship from the German Federal Government. The scholarship covers the current costs of living, all MGG-related costs and travel expenses in Germany and Europe as well as health, personal liability and accident insurances during the training in Germany. Candidates for the MGG Academy have to be nominated by their organisation and can then participate in a selection process. Candidates from Europe may exceptionally also apply individually. Please contact Tatjana Reiber or Verena Zehe for further information. The MGG Academy 2019 is taking place from 15 August – 11 December 2019. The call for applications will be closed on 15 February 2019. For general information please click here. To successfully apply to the MGG Academy 2019, please Download the application form and have it duly filled, signed and stamped by yourself and your employer. Please upload the application form part 1 and part 2 duly filled, signed and stamped to your application. (Please upload the whole form as filled pdf-file. Please only print pages 9 and 12 and upload them signed and stamped as scanned copy. Please include application forms part 1 and 2, your CV, diplomas, passport and English language certificate to your online application.) Kindly understand that we are not able to take incomplete applications into consideration.